The six-day (January 17-22) spell of torrential rains and snowfall in the southwestern Balochistan province this year broke all the previous records, killing and injuring people and livestock, razing dozens of residential and commercial buildings to the ground, disrupting the water, power and gas supply systems, putting the telecommunication communication system out of joint and affecting businesses. The affected areas were Kharan, Mastung, Kalat, Harnai, Killah Abdullah, Pishin, Loralai and Ziarat. However, three districts – Pishin, Ziarat and Killah Abdullah – were the most affected where floods wreaked havoc, forcing the government to declare emergency and seek emergency assistance. According to government reports, 13 people were killed and 650 others sustained injuries. The most common health issues in the affected areas were cold flu, upper respiratory tract infection (URTI), pneumonia and fungal and skin infections. In addition, there’s an increased risk of malnutrition among the children due to food shortages and poor access to health services. Since open defecation is the most common practice in these areas, there was strong likelihood of outbreak of diarrhea and other water-borne diseases due to possible contamination of the water supply system by human and animal faeces. PRC RISES TO THE OCCASION: Responding to the government’s request on January 30 for support of the 6,000 affected households, the Pakistan Red Crescent (PRC) deployed its teams for rapid assessment in the eight affected districts. However, owing to its limited capacity and resources, the PRC selected Pishin, Ziarat and Qillah Abdullah. The teams assessed over 6,000 affected households in consultation with the district administrations and other stakeholders and came up with the following three major recommendations. 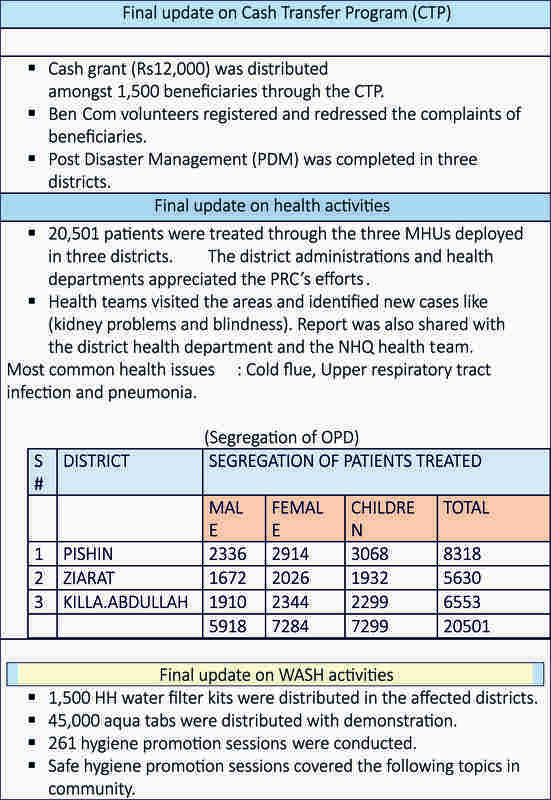 Provision of basic [primary] health care services through the mobile health units [MHUs]. Provision of safe drinking water through water purification tablets and household [HH] level water filters. Provision of short-term food assistance through cash grants. DREF COMES INTO ACTION: In the light of above-mentioned recommendations, the PRC launched a three-month PKR30 million Disaster Relief Emergency Fund (DREF) Operation on February 10 with the assistance and support of the International Federation of Red Cross (IFRC). ALL TASKS ACCOMPLISHED: All planned targets were successfully achieved and the PRC received a massive response from government and local communities. The operation not only fulfilled immediate needs of the people, but also raised their awareness levels to protect themselves from hazards on long-term basis. The overall response is mentioned below in the tabular form. WORKING IN TANDEM: The National Headquarters (NHQ) was in regular coordination with the Balochistan Branch for smooth implementation of the operation. The relief and response activities were implemented in accordance with the IFRC standard practices. The IFRC took the coordination role and maintained regular communication with the in-country PNS, ICRC and external movement partners to inform them about progress on the activities. The IFRC also shared regular updates on the PRC response with other humanitarian actors in the country through the Humanitarian Country Team (HCT), UNOCHA and the Pakistan Humanitarian Forum (PHF). The PRCS also updated its movement partners regularly on the operation and the immediate response actions and planned activities. The other partner organizations actively involved in the operation were the National Disaster Management Authority (NDMA), Provincial Disaster Management Authority (PDMA) Balochistan, Department of Health Balochistan and respective districts administrations.